The saddest thing about winter is the lack of posts that I have and that I have to go back to old pictures and post them to make up for it. Only a few more months and I’ll be back in the groove! However, this is an interesting post (to me, anyway) that Punit reminded me of last night. I would always go into my folders of pictures and see if there are any hidden gems that I might have missed and I always end up going into Punit’s folder and right back out again. Why, you ask? Because in all this time of knowing him, the only time I shot his car was back in 2009 and that was when we barely knew each other, and that was also when I first started shooting and started getting the hang of it. At the time though, they did beat any point and shoot lol. Anyways, similar to JC or Ricky, Punit is/was always at the photoshoots of the handful of other cars I’ve shot. It’s not like I never see them or they never drive their cars. They do, in fact drive their cars everywhere we go… Except it’s to shoot other cars or for me to ride shotgun in to do rolling shots. We always get so caught up in shooting all the other cars that we never really think about shooting our own. Even when we talk about it, we don’t really feel like shooting our own cars and I think it’s cause we’re just around each other all the time that we don’t see the point. In retrospect, I really regret not being able to shoot Punit’s car in the various stages that it’s been in. I’m actually embarrassed that I’ve only ever shot it once and it was when I sucked balls. All other times were random shots and I think his car deserves more than that. 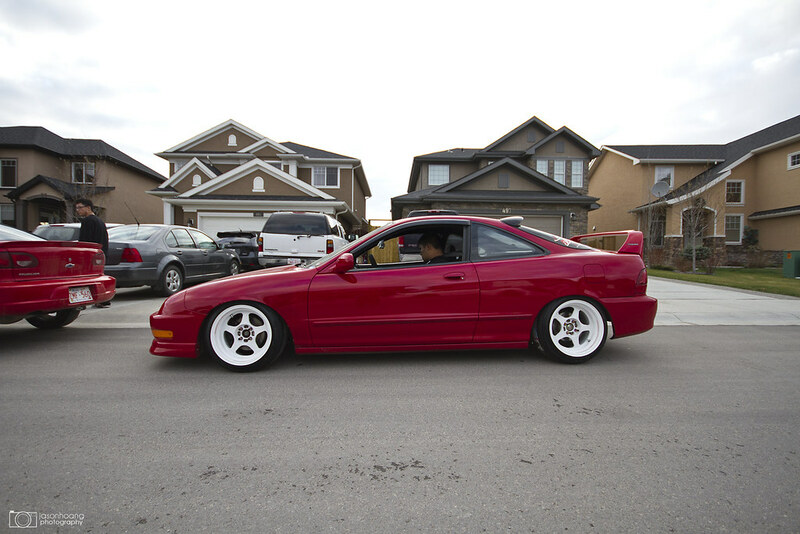 This was when I first met Punit – the Integra was done up decently and he had just gotten rid of his Rota’s for the Work Meister S1’s that are now purple and on Diana’s Fit. Unpainted carbon hood and hatch, the basic interior mods like Recaros and ITR wheel. 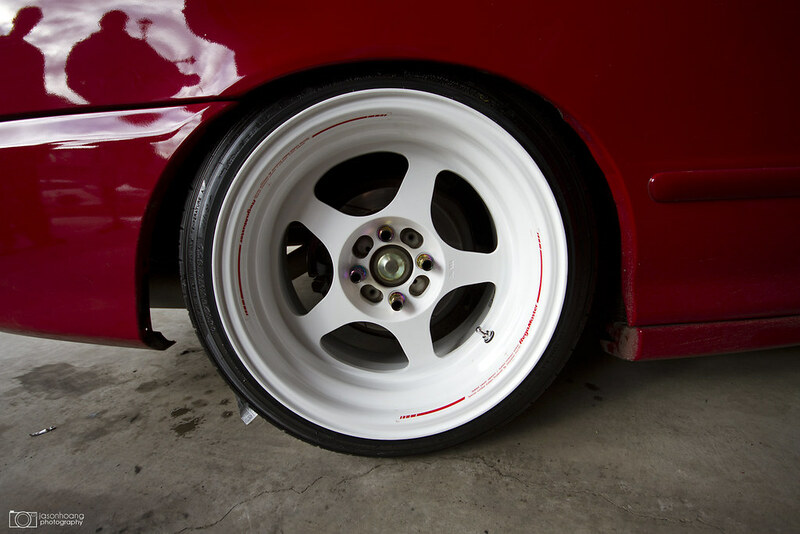 Keep in mind this was way back in 2009 when real wheels were rare to see… This was considered quite modded back then. 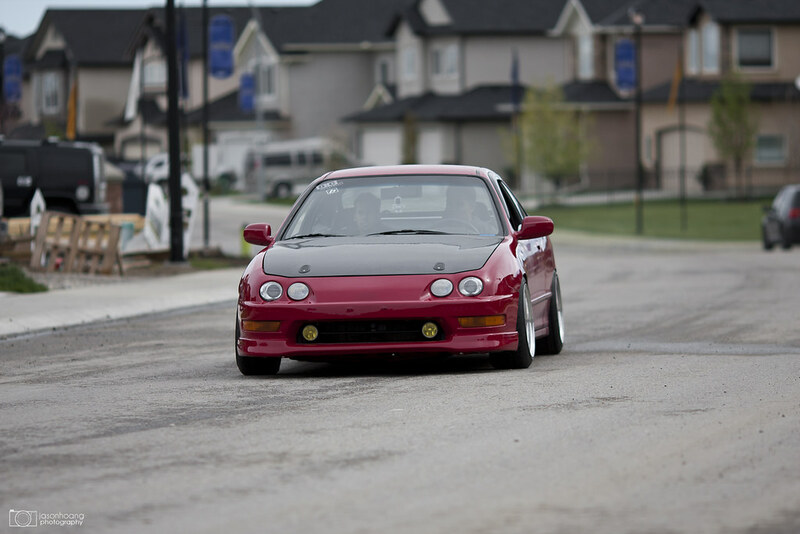 Soon after he picked up a set of very aggressive CCW’s and again, at that time – the wheel specs were unheard of for a stock body Integra. Even with a wide angle, from the back of his car you could see the crazy amount of camber. Side profile was winning though. White on red was perfect. This was just as winter was finishing up and we all went over to his place to get the wheels on and his interior back in after he had it repainted. The only differences here from the first picture is the addition of the Mugen wing, his K24 swap and Spoon exhaust. He also dialed it in a little lower and of course the insane amount of camber. 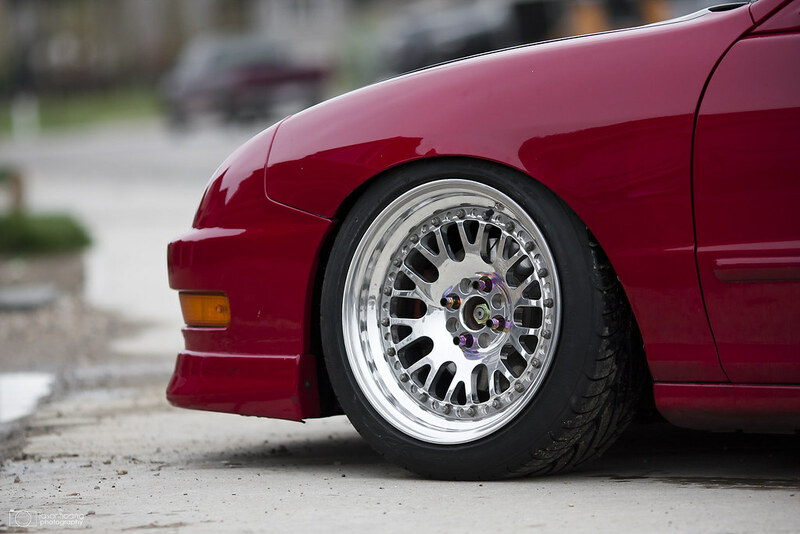 Front fitment – with more dish than my SSR’s lol *facepalm*. He also got a lot of hate for this set up too, but it was awesome IMO. The rear wheels. Absolutely love how they look. And that is the final shot I really ever had of Punit’s car. I didn’t even get a chance to shoot it while it was on the Regamasters which I also regret dearly. However, I think with the changes Punit has in store for this summer, the photoshoot I want to have will be perfect.